We are delighted to announce that we now offer online Equine Clinical Coach Training. 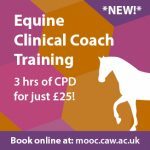 The course is designed for veterinary nurses or surgeons who will be acting as clinical coach for student veterinary nurses within equine practice. The course will be particularly helpful for those struggling to arrange to take time out of practice for standardisation training. What’s more – the training is just £25! Get your free VN Times subscription!